Whether you want to meet outside or inside we have the place for you. An outdoor pavilion that is complete with water, electric, and lighting, is centrally located in the main section of the grounds. 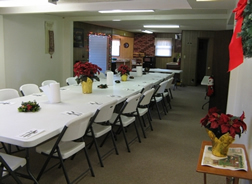 Below is an indoor club house for rallys that will comfortably seat up to 40 people. 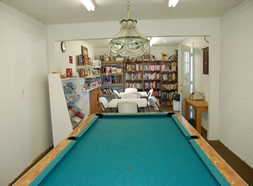 The club house is heated and air conditioned for your comfort. 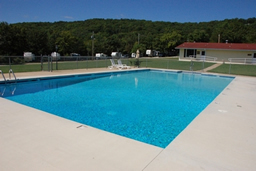 There are complete kitchen and bathroom facilities. Be sure to look at the pictures hanging on the alumni wall of previous rally members that have enjoyed late evening cards and games as well as early morning pancake breakfasts. 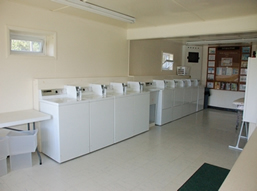 There is a large clean laundry available 24 hours a day for your convenience. The laundry is located on the south end of the large building shown below. Also in the building are extremely large and clean men and women's bathhouses. Our facilities are handicap accessible.